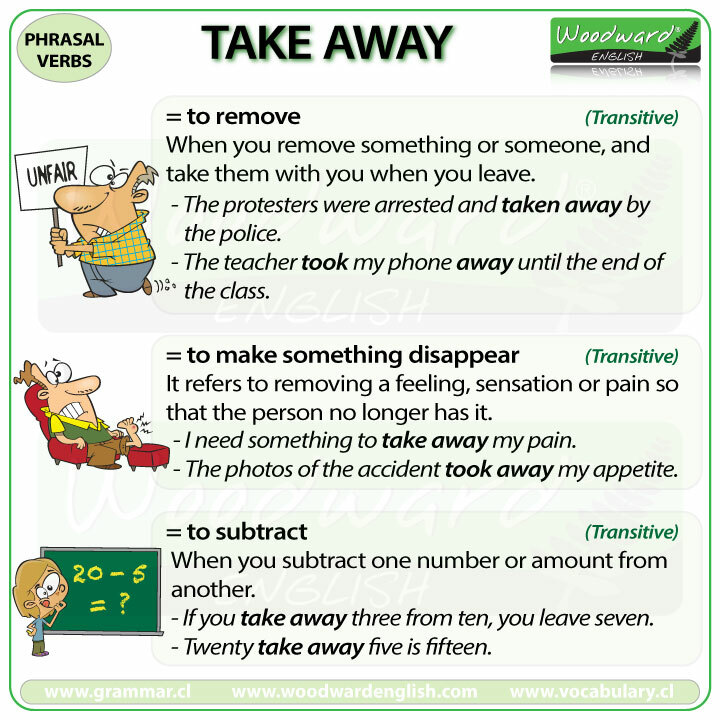 (transitive) When you remove something or someone, and take them with you when you leave. The protesters were arrested and taken away by the police. Can you take your trash away? The boy was taken away from his parents on recommendation of the social workers. The teacher took my phone away until the end of the class. (transitive) It refers to removing a feeling, sensation or pain so that a person no longer has it. I need something to take away my pain. The photos of the road accident took away my appetite. Nothing can take away the pain of losing a child. (transitive) When you subtract one number or amount from another. If you take away three from ten, you leave seven. Twenty take away five is fifteen.